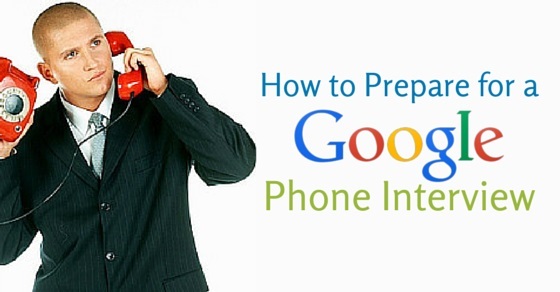 How to Prepare for Google Phone Interview? Google is an all American technological organization that functions in numerous countries across the globe. This technology company is world renowned for its exemplary net related products and services. From gym facilities and slide in-between floors to a mind boggling variety of foods to choose from, Google looks into every need of its employees, and then it is not for nothing that everyone wants to be a part of the Google family. Here are some extremely easy tips to help you prepare for and crack a Google phone interview; those who take out time to study for their interview tend to do much better than those who do not. Just remember that the interviewing engineer has taken time out of his busy schedule to take your interview so you should do the same, make sure that during the phone call you are not outside or around many people. A lot of background noise in the form of people conversing with one another or loud music from the television creates a really bad impression in the mind of the engineer, hinting at the fact that you do not care enough to make sure that you have place yourself in a quite environment where you can give your one hundred percent. Besides making sure that you will not be disturbed ensure that you have kept a copy of your transcripts, a note book and a pen handy to note down anything important. It is essential to quickly jot down the name of the engineer so that you don’t accidentally forget it. To avoid any embarrassment it is important to make sure that you keep yourself updated with various important programs pertaining to computer science. Some subjects that you should look into include- Algorithms, coding and data structure. Even if you think that you have sound technical knowledge in the field it is important to practice. If the interviewer notices that you are fumbling, making silly mistakes or not being able to answer simple questions then he will naturally assume that you will not be fit for the job. One book that you can look into is ‘The Algorithm Design Manual’ by Steven S. Skiena. When it comes to interviews there is no one who does not get nervous. An interview with Google is small thing. It is alright to have butterflies in your stomach but you should make sure that you do not let your nervousness prevent you from delivering your best. The atmosphere at Google offices is very relaxed and they do not even insist on employees wearing formal clothes on a daily basis. Their policy is you “You shouldn’t need a tie to be taken seriously!”. A telephonic interview isn’t all that frightening as you do not have to be wary of body language or personal appearance in terms of attire. When you are calm and collected you automatically are able to speak better and in a more coherent manner. But this does not mean that in an attempt to sound calm you end up sounding laid back or disinterested. The interviewers are going to be looking at the manner in which you approach every question that they throw your way. Furnishing yourself with answers to the questions that they regularly ask is always a good idea. Do not assume that just because you are familiar with the principle things, you will be able to get through the interview successfully. Often though we are familiar with answers, we find it tough to coherently get our words and thoughts across and end up using extremely unprofessional statements like ‘you know what I mean’ or “you get the point”. The interview questions might cover anything that is on your CV. Thorough knowledge on the fundamentals of Computer Science is a must for any engineering job that you might apply for at Google. The questions will test your knowledge on topics like-logical problems, hash tables, stacks, system design and arrays. If you answer the questions well and confidently then you have nothing to worry about. In the course of the interview if you could not hear something clearly or did not understand something that was said, do not hesitate to ask the interviewer to repeat his or her words. They will appreciate if you ask appropriate questions or even clarify doubts that you might be having in mind. In the midst of solving an algorithm if you get stuck they might even give you a tip or two. Keep your ears open at all times and be attentive to any assistance the interviewer might be giving you. In an attempt to come across as a genius do not be deaf to what the interviewer is trying to tell you. The interviewer is going to see if you are keeping your ears open to the hints and if you are heeding to them. Do not be confused and think that the interviewer is simply trying to vex you. Google is a company that encourages its employees to speak their minds. If you would like to say something you should go ahead and say it. Just because you would not like it to seem like you are challenging or being disrespectful to the interviewer that doesn’t mean you do not speak up when you need to. There are plenty of ways to get your views or point across without sounding egoistic and disrespectful. Your interesting ideas might provide you with an edge over everyone else who has applied for the same post. You will create a great impression if you are able to find new ways of problem-solving or even if you are open to new ideas. There are numerous people out there who are always willing to give you advice, whether or not you ask for it. Do not believe everything you hear. Sometimes people will tell you to prepare answers to the questions like ‘Where do you see yourself in twenty years’ or ‘Why do you want to be a part of the Google family’? Don’t bother yourself thinking about answers to questions like these. The interviewer will be an experienced professional who will not waste time discussing things like this. So listen to the advice people are willing to give you but don’t believe every word of it as if it were Gospel truth. Though their may be some open ended questions like what are some of your ideas for improving an existing Google product or What were some of the biggest technical challenges that you faced in your previous work place. It would benefit you greatly to have an understanding of the various services and products that the company has to offer. Sometimes you might be asked a simple question that might make your mind go blank. One of the most common questions that people are unable to get right is- ‘What is the color of each alphabet in the word ‘Google’ on the Google homepage?”. So make sure you do some background reading so that you are able to make a good impression. You can do your reading up from this link http://www.google.com/corporate or even by glancing though Wikipedia’s Google page. A Google interview generally takes 45 minutes to one hour. At the end of the interview you are usually asked if you have any questions that you would like to ask. It is not mandatory to ask questions, but doing so is alright. Do not make the mistake of asking ‘So how was my interview’ or ‘how did I do’. When they urge you to ask questions they usually mean questions pertaining to the company like how is the work environment, what are the work hours etc. So you could think about the questions you would like to ask in advance so that during the interview your mind does not go completely blank. Remember the last few words that you say are going to create a lasting impression in the mind of the interviewer and therefore you should continue to have your wits about you even after the interview questions are asked. These are some of the easy tips and tricks that you can make use of to prepare yourself for a Google interview. At the end of the day mere bookish knowledge is not going to get you into Google. They keep an eye out for individuals who are able to solve problems in new and unique ways, so you must ensure that you are able to think quickly on your feet and try to be original with your answers. If you get a chance to Google it will surely be a chance of a lifetime. How to Give Self Introduction in Interview Easily? Top 20 Java Interview Questions – How to Answer Them? Problem Solving Questions: What are They – How to Answer?